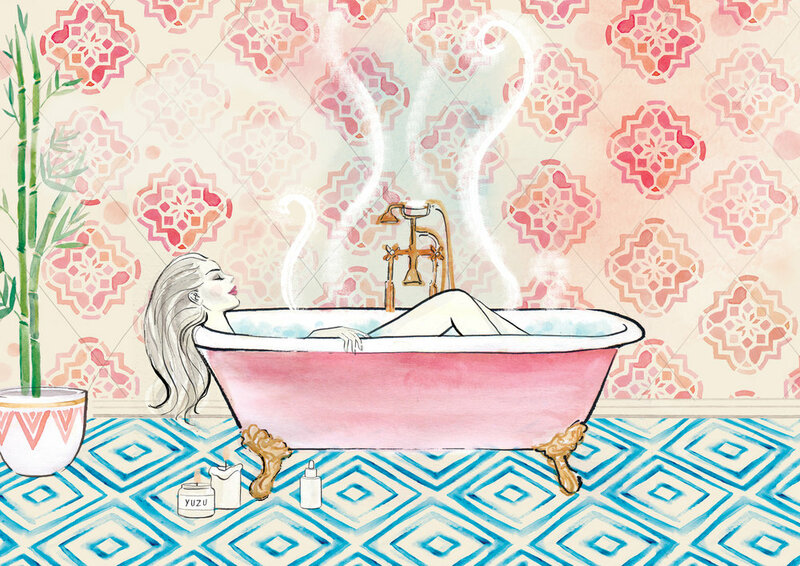 For the January 2019 issue of women’s health and lifestyle magazine, Top Santé, I was asked to create some illustrations for a feature on the beauty of bathing. A subject I can definitely get behind as I love nothing more than a nice relaxing bath, especially during winter! The article featured products and remedies from various countries, such as Japan, France and Turkey. I represented each of these within certain elements of the main image. The tiles are inspired by those seen inside Turkish bath houses, the bamboo is a nod to Japan, and of course I have drawn a beautiful french style, roll top bath. With gold taps and ornate legs, this is pretty much my ideal bath! Overall I have tried to create a sense of luxuriousness, femininity, calm and beauty within the illustrations.